For those of a similar name, see John Weber (disambiguation). John Webber RA (London 6 October 1751 – 29 May 1793 London) was an English artist who accompanied Captain Cook on his third Pacific expedition. He is best known for his images of Australasia, Hawaii and Alaska. Webber was born in London, educated in Bern and studied painting at Paris. 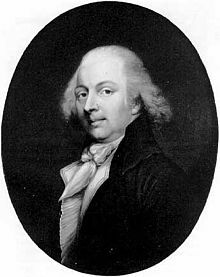 His father was Abraham Wäber, a Swiss sculptor who had moved to London, and changed his name to Webber before marrying a Mrs Mary Quant in 1744. Webber served as official artist on James Cook's third voyage of discovery around the Pacific (1776–80) aboard HMS Resolution. At Adventure Bay in January 1777 he did drawings of "A Man of Van Diemen's Land" and "A Woman of Van Diemen's Land". He also did many drawings of scenes in New Zealand and the South Sea islands. On this voyage, during which Cook lost his life in a fight in Hawaii, Webber became the first European artist to make contact with Hawaii, then called the Sandwich Islands. He made numerous watercolor landscapes of the islands of Kauai and Hawaii, and also portrayed many of the Hawaiian people. Back in England in 1780 Webber exhibited around 50 works at Royal Academy exhibitions between 1784 and 1792, and was elected an associate of the Royal Academy in 1785 and R.A. in 1791. Most of his work were landscapes. Sometimes figures were included as in "A Party from H.M.S. Resolution shooting sea horses", which was shown at the academy in 1784, and his "The Death of Captain Cook" became well known through an engraving of it. Another version of this picture is in the William Dixson gallery at Sydney. The Anchorage Museum of History and Art (Alaska), the Bishop Museum (Honolulu), the Honolulu Museum of Art, the Peabody Essex Museum (Salem, Massachusetts), the Yale University Art Gallery, the British Museum, the Sir John Soane's Museum (London), The National Maritime Museum (London), the Museum of New Zealand Te Papa Tongarewa , the John Carter Brown Library, and the Mitchell Library (Australia) are among the public collections holding works by John Webber. Webber's art is held by a number of Australian institutions including the National Portrait Gallery (William Bligh, c.1776, The Death of Captain Cook (engraving), 1784, and Portrait of Captain James Cook RN, 1782); the Australian National Maritime Museum (View of Huaheine, 1784); the Art Gallery of New South Wales (A View in Otaheite Peha, 1785); the National Library of Australia (includes Sea Otter, 1778, A Woman of Pulo Condore, 1780, Portrait of Captain John Gore, 1780, Poedua, Daughter of Orea, King of Ulietea, Society Islands, 1782, Portrait of Captain James King, 1782, A Dance in Otaheite, 1784, A Woman of Van Diemen's Land, 1784, A Chief of the Sandwich Islands, 1787, and The Resolution Beating Through the Ice, 1792,); the Dixson Library (includes An Opossum of Van Diemen's Land, 1777, Red-tailed Tropic Bird, 1777, and The Death of Captain Cook, c.1781-83. ); and the National Gallery of Victoria (A Night Dance by Men, in Hapaee, 1784, A Young Woman of the Sandwich Islands, 1784, and A Man of Van Diemen's Land, 1784.). Wikimedia Commons has media related to John Webber. Forbes, David W., Encounters with Paradise: Views of Hawaii and its People, 1778-1941, Honolulu Academy of Arts, 1992, 15-85. ^ William Hauptman, "Webber before Cook: two water-colours after Sterne," The Burlington Magazine, Vol. 136, No. 1903 (Apr 1994), p. 237. ^ a b c Percival Serle, ed. (1949). "Webber, John". Dictionary of Australian Biography. Angus and Robertson. ^ "A young woman of the Sandwich Islands". British Museum. Retrieved 8 July 2018. ^ "John Webber 1752 – 1793: William Bligh". portrait.gov.au. National Portrait Gallery. Retrieved 16 November 2017. ^ "View of Huaheine". collections.anmm.gov.au. Australia National Maritime Museum. Retrieved 16 November 2017. ^ "A view in Otaheite Peha". artgallery.nsw.gov.au. Art Gallery of New South Wales. Retrieved 16 November 2017. ^ "1778, English, Art work edition: Sea otter". trove.nla.gov.au. National Library of Australia. Retrieved 16 November 2017. ^ "1780, English, Art work edition: A woman of Pulo Condore". trove.nla.gov.au. National Library of Australia. Retrieved 16 November 2017. ^ "1780, English, Art work edition: Portrait of Captain John Gore". trove.nla.gov.au. National Library of Australia. Retrieved 16 November 2017. ^ "1782, English, Art work edition: A Portrait of Poedua". trove.nla.gov.au. National Library of Australia. Retrieved 16 November 2017. ^ "1782, English, Art work edition: Portrait of Captain James King, commander of Discovery during Cook's third voyage". trove.nla.gov.au. National Library of Australia. Retrieved 16 November 2017. ^ "1784, English, Art work edition: A dance in Otaheite". trove.nla.gov.au. National Library of Australia. Retrieved 16 November 2017. ^ "1784, English, Art work edition: A woman of Van Diemen's Land". trove.nla.gov.au. National Library of Australia. Retrieved 16 November 2017. ^ "1787, English, Art work edition: A chief of the Sandwich Islands". trove.nla.gov.au. National Library of Australia. Retrieved 16 November 2017. ^ "1792, English, Art work edition: The Resolution beating through the ice, with the Discovery in the most eminent danger in the distance". trove.nla.gov.au. National Library of Australia. Retrieved 16 November 2017. ^ "An opossum of Van Diemen's Land, 1777 / drawn by John Webber". archival.sl.nsw.gov.au. State Library of New South Wales. Retrieved 16 November 2017. ^ "Red-tailed tropic bird, 1777 / drawn by John Webber". archival.sl.nsw.gov.au. State Library of New South Wales. Retrieved 16 November 2017. ^ "Death of Cook, ca. 1781-83? / John Webber". archival.sl.nsw.gov.au. State Library of New South Wales. Retrieved 16 November 2017. ^ "A night dance by men, in Hapaee". ngv.vic.gov.au. National Gallery of Victoria. Retrieved 16 November 2017. ^ "A young woman of the Sandwich Islands". ngv.vic.gov.au. National Gallery of Victoria. Retrieved 16 November 2017. ^ "A man of Van Diemen's Land". ngv.vic.gov.au. National Gallery of Victoria. Retrieved 16 November 2017. The National Library of Australia (NLA) is the largest reference library in Australia, responsible under the terms of the National Library Act for "maintaining and developing a national collection of library material, including a comprehensive collection of library material relating to Australia and the Australian people." In 2012–13, the National Library collection comprised 6,496,772 items, and an additional 15,506 metres (50,873 ft) of manuscript material. It is located in Parkes, Canberra, ACT. The Royal Society of Tasmania (RST) was formed in 1843. It was the first Royal Society outside the United Kingdom, and its mission is the advancement of knowledge. The Tasmanian Museum and Art Gallery (TMAG) is a museum located in Hobart, Tasmania. The museum was established in 1846, by the Royal Society of Tasmania, the oldest Royal Society outside England. The TMAG receives 400,000 visitors annually. Carol Jerrems was an Australian photographer/filmmaker whose work emerged just as her medium was beginning to regain the acceptance as an art form that it had in the Pictorial era, and in which she newly synthesizes complicity performed, documentary and autobiographical image-making of the human subject, as exemplified in her Vale Street. King George Island is an island in south-eastern Australia. It is part of the Sloping Island Group, lying close to the south-eastern coast of Tasmania around the Tasman and Forestier Peninsulas. The island was once inhabited and farmed and contains the ruins of two buildings on its eastern side. A conservation covenant is in place on this island. William Paxton was a South Australian colonist who arrived in 1840, became one of the investors in the Burra copper mines and returned to England in July 1855, a wealthy man. Mary Morton Allport was an English Australians artist who is thought to be Australia's first colonial professional female artist, lithographer, etcher and engraver. Mary painted landscapes and miniature portraits.